It has been over a month since Prime Minister Narendra Modi announced his decision to delegitimise Rs 500 and Rs 1000 currency notes. There have been several reports detailing how the move has adversely affected small and medium-scale industries across India. The holy city of Varanasi - famous for its textiles, as well as for being the Prime Minister's Parliamentary constituency - is no exception. The note ban has hit the city's weavers hard. Many of them are now migrating from the region in search for other employment opportunities. Avinash Tiwari has closely observed Varanasi's saree trade for a long time. "The saree business has been reduced by half, even during the wedding season. Wholesale traders, whose annual turnover is close to Rs 100 crore, have lost around 25% of their business. Retailers are not buying goods, due to the lack of customers. Craftsmen are no longer producing sarees, as they have no money to procure raw material," he says. According to Tiwari, there is a clear difference between trade figures before and after demonetisation. The saree trade is weaver Hasibuddaula's bread and butter. But he has spent most of the last 15 days visiting his bank, looking to withdraw his own money. "Every day, I go to the bank, but return empty-handed. I feel like poisoning myself or smashing the windows of the bank," he laments. Thousands of weavers like Hasibuddaula are forced to leave their work to stand in bank queues, day in and day out. This is the predicament faced by almost all of the artisans employed in this trade. Localities like Jaitpura and Ausanganj were noisy hubs of the powerloom industry in Varanasi before 8 November. But these days, one finds an eerie silence in these areas. 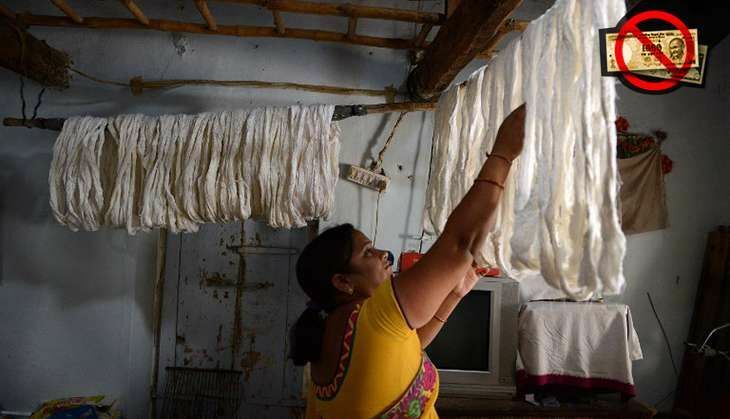 Abid Ansari, a resident of Jaitpura, has been running a powerloom for the past 15 years. He is now making an effort to migrate to Saudi Arabia. He says: "The note ban has further added to our debts. Every day, we join bank queues after morning namaaz and wait for our turn till evening. It proves to be a futile effort most of the time. "Many people alienated from this trade had high hopes from Modi. However, he has worsened our condition. Inflation, coupled with the note ban, has ruined us." Abid is not the only one looking for greener pastures abroad. The migration of weavers from Varanasi is only likely to intensify in the near future. One can find people willing to leave their work almost in every locality. One such weaver, Nanu, has now started a business of selling bamboo tables and chairs on the city's ghats. Ramasre, another weaver from the Sonarpura area, is worried about the approaching wedding of his daughter. He has not even been able to buy sarees for the occasion. "Even if I am able to withdraw cash, it would not be sufficient to make arrangements for baraat or giving dowry," he rues. "Wholesale traders have stopped selling raw material. They are not willing to provide silk on credit. The 'acche din' are over for us. We don't know what to do and where to go."